Words of celebration and inspiration as HGSE presents Convocation honors. In a Convocation ceremony filled with messages of hope, perseverance, and inspiration — and the rhythms of poetry — the Harvard Graduate School of Education affirmed its central mission as a community of learners dedicated to changing the world through education. HGSE degree candidates, their faculty, and their friends and family members gathered for the annual ceremony in Radcliffe Yard on the warmest day of the spring — the sunny afternoon well matched to the mood of the graduating cohort . “Lift up your eyes upon/This day breaking for you,” said Convocation speaker Freeman Hrabowski, beginning his talk with the transcendent words of Maya Angelou. Conjuring themes of justice and equality — drawing on the lessons of his mother and the history of the civil rights movement — he urged graduates to remain passionate about the power of education to transform lives. Graduating from an institution where they received “the top education in the world,” HGSE graduates must play a role in helping people “learn to listen and to open their hearts and their minds to people who are different from ourselves, whatever those differences are. Whether it’s about sexuality, race, income, religion … we must teach Americans to get beyond their comfort zones, to get beyond people who look just like themselves, to open our hearts and our minds to the possibilities, and to listen to different perspectives,” he said. Student speaker Donovan Livingston, an Ed.M. candidate in Learning and Teaching, delivered his address in the form of a spoken-word poetry performance. It was a stirring rejection of the status quo — and a soaring affirmation of the right to be heard, the right to strive, and the right of all children to know their potential. To be an educator, he said, is to chart the night skies — seeing the light in the eyes of every student, amid the darkness that surrounds. “Are we not astronomers — looking for the next shooting star? 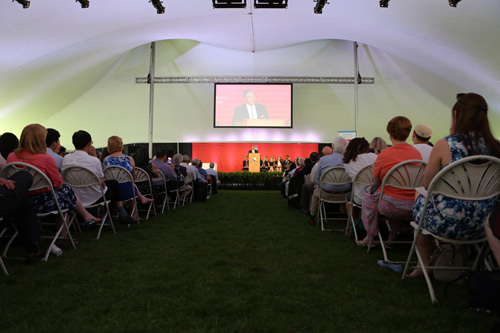 Among the other honors presented at Convocation were the Morningstar Family Teaching Award, the Alumni Council Award, the Phyllis Strimling Award, and the Intellectual Contribution/Faculty Tribute Awards, along with the presentation of the 2016 class gift.